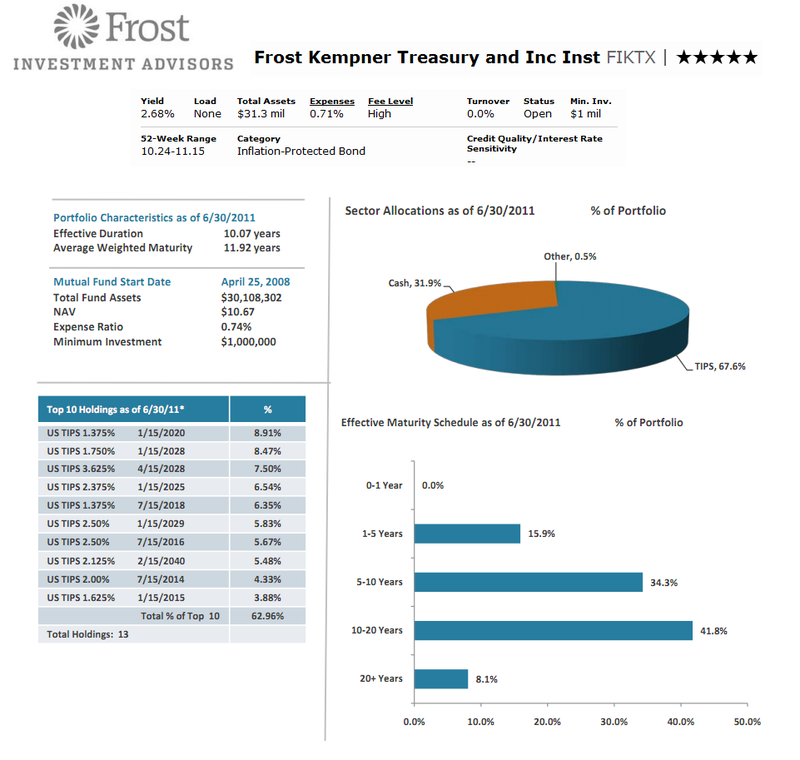 The following article is about Frost Kempner Treasury and Income I fund. This fund is rated as one of the best inflation protected bond mutual fund. Details about the fund reviews can be found below. The Frost Kempner Treasury and Income fund objective is to provide current income consistent with the capital preservation. The fund typically invests majority of net assets (>80%) in full faith and credit U.S. Treasury obligations. 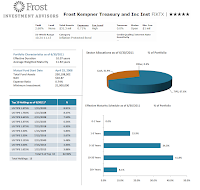 This Frost fund's investments include Treasury bonds, Treasury notes, Treasury Inflated Protection Securities, and short-term U.S. government money market funds. Harris L. Kempner, Jr., R. Patrick Rowles and Shawn Leon Gault have managed this Frost Funds since its inception in April 2008. Three of them are President, Executive Vice President and Vice President of Kempner. This best bond fund has 0.71% expense ratio per year. The average expense ratio for the inflation-protected bond fund category is 0.84%. As part of no load fund, this fund has no 12b1 fee and no front-end sales load fee. It shares 2.77% dividend yield. The last dividend distributed in June 2011 was 0.15. The annual holdings turnover rate as of July 2011 is 28.0%, which is very low compared to the average in the category (126.75%). This FIKTX fund has returned 5.22% over the past one year and 5.69% over the past three years. Even though this fund is still considered as new fund, but it has gotten 4-stars rating from Morningstar. Since its inception, this top fund has achieved two years of positive return. This Frost fund is only available in Institutional class only. It is currently available for purchase at certain brokerages, such as Pershing FundCenter, Schwab Institutional, JPMorgan, Schwab RPS SDE, Schwab Institutional Only, Schwab RPS All, Scottrade TF and JP Morgan No-Load Transaction Fee. The benchmark of this fund is Barclays Capital US Treasury Bond Index. The sector allocation of this FIKTX fund as of June 2011 is 67.6% in TIPS, 31.9% in Cash, and 0.5% in Other. This fund has 13 total holdings per the second quarter of 2011 and the top 10 holdings represent 62.96% of the total portfolio. According to the fund’s prospectus, the fund principal risks include Interest risk, Credit risk, etc. The fund's effective duration is 10.07 years.